April 15, 2011 - GE Aviation broke ground today on its new Electrical Power Integrated Systems Research and Development Center (EPISCENTER) on the University of Dayton campus in Dayton, Ohio. The $51 million center will be built on about eight acres on the University of Dayton’s campus on River Park Drive. “GE’s new R & D center will be the southern anchor to the Ohio Aerospace Hub of Innovation and Opportunity,” said Lorraine Bolsinger, president and CEO of GE Aviation Systems. The University is working with CityWide Development Corp. to build the facility to GE’s specifications. GE is finalizing a long-term lease agreement with the University of Dayton and CityWide. The 120,000 square foot facility is expected to be completed by the third quarter of 2012 and operational by the end of 2012. "Without a doubt, it's extraordinary for a Fortune 100 corporation to build a multi-million-dollar research facility on a college campus in today's economic climate,” said Daniel J. Curran, president of the University of Dayton. The center’s close proximity to Wright-Patterson Air Force Base and the University of Dayton Research Institute is important in order to provide significant new support to the Air Force Research Labs and the University of Dayton. The University’s researchers will work with GE to develop and deploy computer modeling, simulation and analysis of advanced, dynamic electric power systems design and controls. The center will be directed at several markets including end-to-end electrical power starter/generation, conversion, distribution, and load technologies for civil and military aerospace applications. 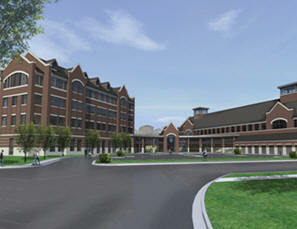 In November 2010, GE announced it would build the EPISCENTER on the University of Dayton campus. The project was enabled by an Ohio Third Frontier capital grant for up to $7.6 million. While GE recognized the value of locating in the Aerospace Hub, making such a decision competitive with other options required significant collaboration between UD, GE, the City of Dayton, Montgomery County and CityWide Development Corporation. It also demonstrates the value of the Aerospace Hub in attracting jobs and providing a focus for economic development efforts. The EPISCENTER will complement GE Aviation’s new Electrical Power Integrated Center (EPIC) located in Cheltenham, UK, which will be operational this year. Together, these two research centers will augment GE Aviation’s existing research and development capabilities, further enabling collaborative research and driving innovation. GE Aviation, an operating unit of GE, is a world-leading provider of jet engines, components and integrated systems for commercial and military aircraft. GE Aviation has a global service network to support these offerings. GE Aviation Systems LLC and GE Aviation Systems Ltd are subsidiaries of General Electric Company.